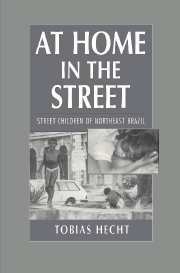 Through innovative fieldwork and ethnographic writing, Hecht lays bare the received truths about the lives of Brazilian street children. This book changes the terms of the debate, asking not why there are so many homeless children in Brazil but why - given the oppressive alternative of home life in the shantytowns - there are in fact so few. Speaking in recorded sessions that participants called "radio workshops," street children asked one another questions that even the most experienced researchers would be unlikely to pose. At the center of this study are children who play, steal, sleep, dance, and die in the streets of a Brazilian city. But all around them figure activists, politicians, researchers, "home" children, and a global crisis of childhood. Introduction; 1. Speaking of the street; 2. Being in the street; 3. 'Home' children: nurtured childhood and nurturing childhood; 4. Betraying motherdom: Maloqueiros and 'that life' in the street; 5. When life is nasty, brutish and short: violence and street children; 6. Curing street children, rescuing childhood; 7. Street children and their 'clients', conclusion: the ephemeral lives of street children; Appendix: the setting: Recife, Olinda, and Northeast Brazil; Glossary; References cited; Notes.